What Happens When You Put Eggshells in the Fireplace? Although it seems like a question for pyromaniacs or teenagers with a little too much time on their hands, the question of what happens to eggshells they're when burned is of interest to a wide range of farmers, gardeners and academics. Eggshells are a valuable source of calcium and are found on archaeological sites around the world. When you put eggshells in the fireplace, they undergo chemical changes, making them a valuable nutritive addition to wood ash when used as fertilizer. Burning eggshells is a surprisingly widespread practice. 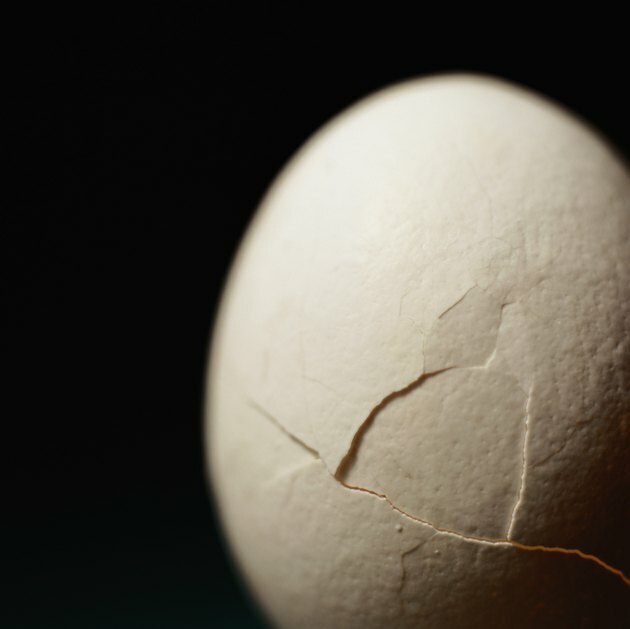 Eggshells are made up largely of calcium, with calcium carbonate making up 95 percent of the dry eggshell. The average shell also contains about 0.3 percent phosphorus, 0.3 percent magnesium and smaller trace quantities of iron and copper metals, along with sodium, potassium, zinc and manganese. Of these chemical compounds, calcium carbonate does not combust, though it can undergo a thermal decomposition reaction if temperatures approach 1,000 degrees Fahrenheit and will produce calcium and lime. In most home burning situations, enough calcium carbonate remains unconverted for the eggshell or shell fragments to hold their shape, though the color will change from the unburned hue to brown and then gray as the fragments are more and more deeply charred. Since the calcium carbonate in eggshell doesn't combust, it remains in the wood ash that's left behind when the fire goes out. Organic farmers and those with hobby farms often use wood ash as a natural fertilizer that's free of industrial chemicals. The calcium and calcium carbonate act like lime, adding alkalinity to the soil and maintaining conditions that aren't overly acidic. Any other trace elements in eggshells that weren't burned away will also add nutrients to the soil, such as potassium and manganese, that are important in plant nutrition. Providing adequate calcium is particularly important in the prevention of diseases such as blossom end rot that occur most often in cases of calcium deficiency and drought stress. Wood ash itself is also alkaline, so the combination of ash and eggshell creates a potent alkalinizing agent that can balance even strongly acidic soils — but it should be used with caution. Ash and eggshell should not be used around acid-loving plants such as blueberries or roses, as they can change the soil's pH too much and too quickly to maintain plant health. Calcined eggshells, or burned eggshells that are composed almost entirely of the remaining calcium and calcium carbonate, stand up to the test of time in archaeological deposits. Since most organic matter has been burned away, the shells will retain their shape and composition when buried in the soil. Archaeologists have studied eggshells and eggshell distribution to determine the composition of prehistoric diet, to explore the possibility of animal husbandry and even to study very early instances of the use of symbols and symbolic thought in designs scratched on eggshells on early New Zealand sites. Early American superstition suggests that you should never burn eggshells on farms that have laying chickens. The superstition says that when the eggshells are burned, the hens will stop laying. Similarly, when using eggs to bake a cake, the eggshells shouldn't be burned until the cake has risen, but placed on top of the oven to ensure the rising of the cake. The shells should then be burned to ensure that the cake won't fall. These superstitions were both recorded in the mid-1800s and do not have a widespread following today. Do Ashes Help Grass to Grow?